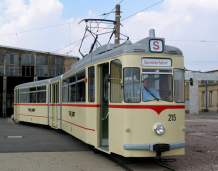 Electric streetcar class Gotha G4-61 manufactured by VEB Waggonbau Gotha in former East Germany (DDR). The car is articulated at 2 points with a short center part. The front part and the rear part of the car have wheels but the center part has not. Photorealistic driver's stand with wheel and handbrake. In OpenBVE there are problems with the zoom level at the driver's stand. 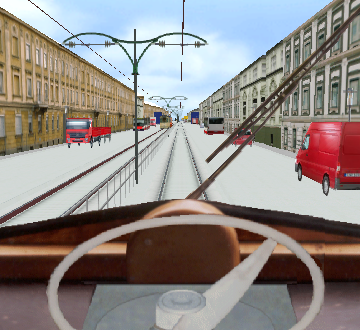 To be able to zoom out so that the driver's stand and the window can be seen at the same time, first move the view downwards and then zoom out. The creator's website has long ago disappeared from the Internet.